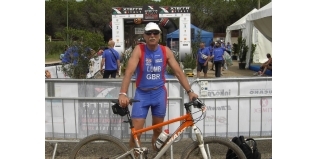 Stuart Lumb, aka Jet Set Super Vet (JSSV) reports on XTERRA Italy, the XTERRA European Championships - plus the joys of transporting a bike box through the London Underground. When racing abroad the actual race sometimes seems a bit like the tip of the iceberg. If I have a poor race (frequently happens these days), then one of the excuses that I come up with is that I was jet-lagged having just returned from a business trip to some far flung corner of the planet. I had been in Bejing in mid May (thereby missing the Dales Etap which I was rather miffed about, although on hearing that the weather was atrocious , I felt rather less miffed), and then had four days at home before leaving for Sardinia to compete in the 2010 XTERRA Italy - Euro Championships. Davide Mancino, the XTERRA press officer had very kindly arranged transport to and from my hotel. This year I was within biking distance of Cale Ginepro, which was the race venue for the fourth year running. I managed to get quite a bit of pre-race biking done, climbing up into the mountains, enjoying the stunning views. My heel now being much better allowed me to get out running as well, but as my cold was lingering on I passed on any swim sessions. On the Friday I went round the actual bike split and was delighted not to get lost, which happened in 2009. 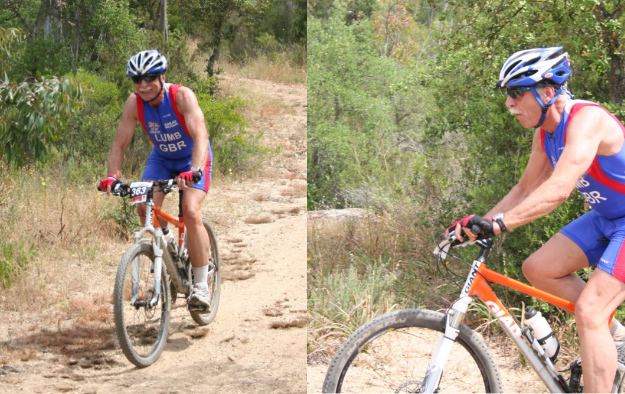 Saturday was registration and briefing day and I bumped into Dave Nicholas, who is XTERRA's ebullient extrovert CEO. 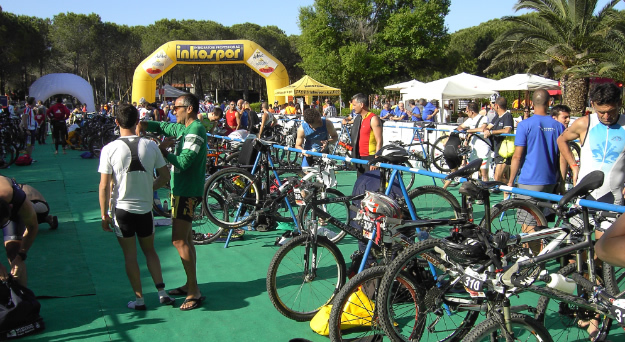 XTERRA races start at civilised times of the morning and I duly packed my race gear into my backpack and on the Sunday morning gently pedalled to transition which was only a few metres away from the beach. The bike split was two laps and pretty technical, involving a climb up a gully half way round and lots of loose gravel. Towards the end of my first lap the Elites started to whizz past me – I try to give way graciously and it's amazing the comments that are made "thanks, merci, danke" with some ignorant ones merely grunting. They'll be old some day! The whole course is in a nature reserve and has to be in one of the most idyllic locations anywhere - too bad it's not possible to enjoy it. The local forest rangers act as marshalls and what amazed me was the number of them fagging it in the tinder dry woods. Amazing! Halfway round my second lap I came round a bend and came across fellow Tyke and Pro racer Daz Parker, who'd damaged herself and her bike and hence sadly posted a DNF. So on again, back into transition and off on the 10km two lap run. You cross the same narrow river as you did on the bike split, but on a swaying suspension bridge which is quite fun, then strike out on a trail for several km. By this time I'd been going about four hours and with the thermometer reading 28°C I was flagging a bit . Then it was the turn point / aid station and back down along the beach , hard going but at least there was a good breeze. 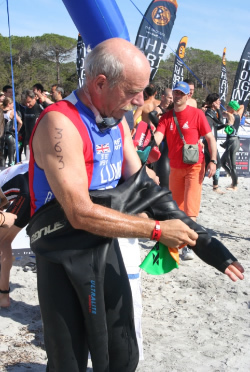 You run - I use that word advisedly in my case - along the beach and I had it in my mind that the finish was reached by passing the swim start and transition. I was mentally geared up to go in that direction when a marshall suddenly appeared out of nowhere, pointing me at an arrow and a distant headland. Needless to say I had another kilometre to run, so had to get my head round that, snaking through the campsite before being cheered on by lucky finishers, relaxing at the café and quaffing foaming tankards full of beer. Then it was a final 100m 'sprint', over the timing mat and another box ticked...I wasn't quite last, not that I'm bothered and it was interesting to see that there were 25 DNFs this year. By this time it was about 4pm. I gathered up all my gear into my backpack and headed off back to my hotel. Needless to say my pack felt twice as heavy as it had done some eight hours earlier that day and I was relieved to reach my hotel and dive into the shower. The awards ceremony and dinner were back at Cale Ginepro but outdoors on a large patio, as opposed to being indoors last year. There was a great bunch of Austrian guys staying at my hotel and they kindly gave me a lift to the bash. As usual the awards were presented in ascending order of age, so I was practically asleep when I had my moment of glory and ascended the podium... then it was back to the hotel and a well earned sleep – after a few beers of course! I was quite a bit slower than last year and put that down to the heat. Amazingly, for a self confessed "carthorse" my run split was my best ranking, followed by my bike and swim splits.